The screenshot above is hosted and provided by vladovsoft.com. Please contact them directly for any copyright infringement as we are not responsible for that content. 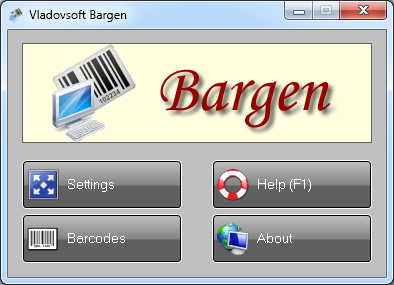 Vladovsoft Bargen is an easy to use barcode generator software. You can use the program to generate many types of barcodes. 34 types are currently supported: EAN 8, EAN 13, ISBN, Code 39, Code 93, Code 128, UPC-A, Codabar, ITF 14, Interleaved 2 of 5, etc. You can also generate 2D barcodes by the QR code standard. Barcode data can be entered manually or imported from Excel or Access files. The generated barcodes can be printed or exported to images (vector or raster). The barcode generator automatically calculates the check digits of the entered barcode and verifies if the barcodes are valid or not. It also lets you specify the size of the barcode label and the distances between the barcodes with accuracy 0.1 mm. If you want you can add images/photos to the barcode labels, for example a photo of the product the barcode represents.